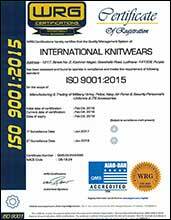 We, at International Knitwears, epitomize durability, reliability and trust. Being pioneers in the field of Military Uniform Accessories & Police Uniform Accessories and nearing five decades of experience in the industry, we have carved a niche in our arena. We are a leading manufacturer, supplier and exporter of Military Uniform Accessories & Police Uniform Accessories and other allied products. Our range of products includes badges, buckles, buttons, shoulder titles, medals, swagger canes,woolen jerseys, woolen socks, gloves, leather & stable belts,aiguillette, lanyards, beret caps, embroidered goods, etc. We strive to completely understand the exact requirements of our valued clients,meeting and exceeding their expectations. Our remarkable position enables us to offer the customers excellent products, rich in the parameters of quality and durability. Adherence to timely delivery schedules and competitive prices has won us a large number of clients from India and worldwide.